Recently, two of the library’s most popular database providers, JSTOR and EBSCO, improved mobile access to their content for researchers. 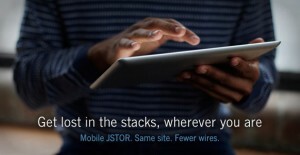 Rather than a device-specific app or a separate mobile site for JSTOR, the company has implemented an “under-the-hood overhaul” that enables the JSTOR interface to adapt to the screen size of a device automatically. Therefore, when you use JSTOR on your phone or tablet, it will scale the screen so that you can use the database comfortably. Read more on the JSTOR website. Read more on the EBSCO support website.